Sophomore Christina Swenson of Marion, Iowa, was crowned St. Lucia on Thursday morning in Christ Chapel at Gustavus Adolphus College’s 73rd annual Festival of St. Lucia. Swenson is a health fitness major who serves as a Collegiate Fellow and sings in the Choir of Christ Chapel. She is also involved as a Gustie Guide, in the Running Club, Prepare Ministries, and Swing Club. She says her favorite Gustavus memory to date is traveling to Guatemala for a mission trip with Prepare Ministries. “Not only was it incredible to experience the culture, but I grew in faith, learned so much about trust and service, and developed lifelong friendships with incredible Gustavus students,” Swenson said. Every year five or six sophomore women are chosen to serve on the College’s St. Lucia Court based on courageous leadership, strength of character, service to others, and compassion. This year’s court included Swenson, Emily Albrecht of Wimbledon, N.D., Haley Coller of Bloomington, Minn., Casey Lindquist of Chanhassen, Minn., Hayley Nemmers of Des Moines, Iowa, and Mikaela Warner of Roseville, Minn. The Festival of St. Lucia begins the Christmas season in Swedish custom and is traditionally held on Dec. 13. On this day in Sweden, the eldest daughter plays the role of St. Lucia by preparing and serving baked goods and coffee to her family during the early morning hours. Wearing a crown of lighted candles, Lucia represents the return of light that will end the long winter nights and serves as a symbol of hope and peace for the Christmas season. 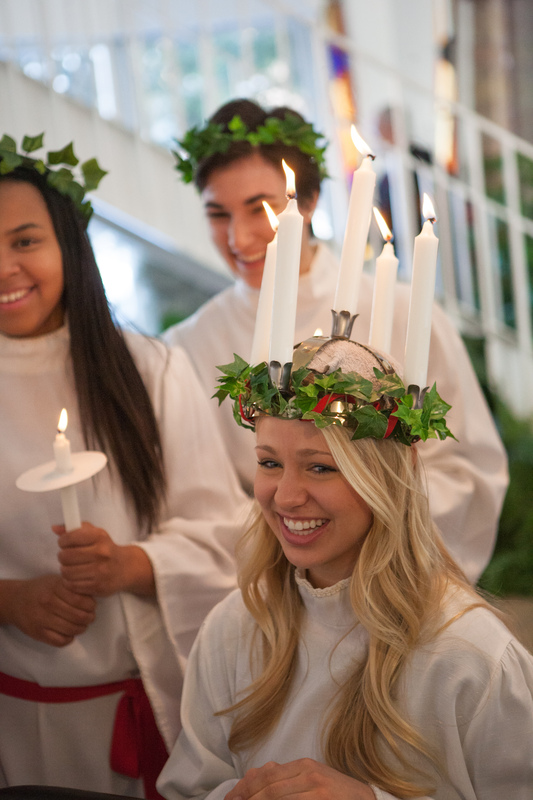 At Gustavus, the St. Lucia Court traditionally sings carols through the College’s residence halls during the early morning hours on the day of the crowning and a traditional Scandinavian smorgasbord luncheon typically follows the ceremony. St. Lucia is chosen through a campus community vote.